Lung Chang Machinery Enterprise Co,.Ltd. was established in 1983. 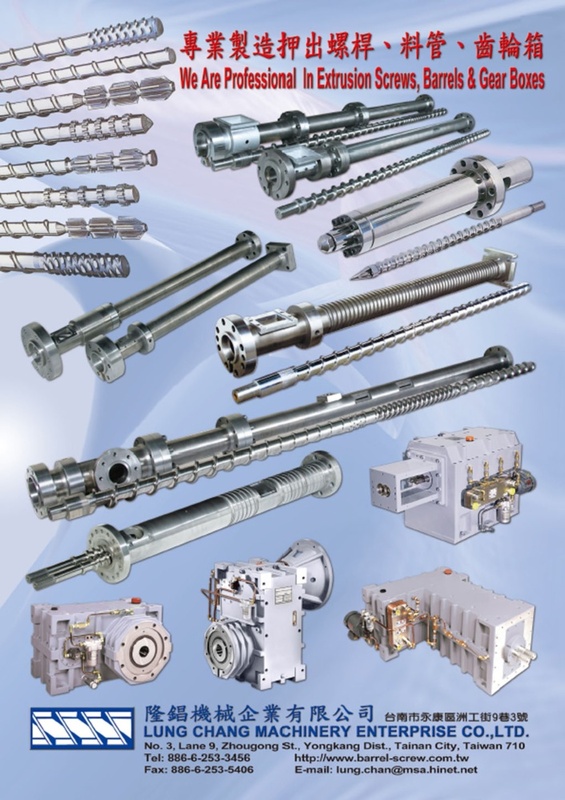 We have long-time, plenty and professional experience in designing, processing and manufacturing screws barrels and gear boxes for plastic machines. We use the latest design concept to produce screws, barrels and gear boxes. In addition to designing the parts based on different properties of each plastic material, we make production according to customers’ prints and requirements as well. The special steel and material we use are hardened and processed carefully through cautious progress. We supply high quality screws and barrels with nitride treatment, hard chrome plating and bimetal procedures. Our products are wear-resistant, rust-resistant, rapid feed speed, smooth, well-mixed and long-life. Moreover, all our products are manufactured by the newest processing machines. Under strict process control and inspection of every procedure, we offer customers precise, lasting and high quality components of plastic machines. Lung Chang Machinery Enterprise Co.,Ltd. always holds the spirit as an artificer to make continuous R&D and improve the quality and efficiency of customers’ machines to create more profits for customers. Our insistence on outstanding quality has earned confidence and good reputation from valued customers both in local and foreign markets.